Pregnancy-related pelvic girdle pain (PPGP) is a very common and universal problem. About 16% to 25% of women experience it at some point during pregnancy. In about five percent of women, PPGP is found to persist after childbirth up to two years. The pain and discomfort may start as early as the first trimester of pregnancy and gradually become severe as the trimesters progress. In some women it may begin as late as the last few days before giving birth. Informing the midwife, or obstetrician about the condition and early treatment can alleviate it. The pelvic girdle is the largest part of our skeleton containing the pubic symphysis, and two sacroiliac joints. A net work of ligaments join these three joints giving them strength. We have to note that pregnancy-related low-back pain, sciatica, visceral or vascular origin syndromes are distinct entities which needs to be excluded before the diagnosis of PPGP is made. European guidelines recommended MRI scan for the differential diagnosis of PPGP in all stages. Inflammation of the joints in the pelvic girdle. Tenderness in the pubic bone area. Difficulty in standing on one leg. Difficulty keeping legs or knees apart. Difficulty in twisting, bending or squatting. Pain may radiate to the legs. Clicking sound or sensation from the pelvic girdle during movement. Depending upon stage of pregnancy and the severity of the condition, the symptoms may vary from individual to individual. The exact causes leading to the development of this syndrome are unclear. Etiological implications may be multifactorial conditions during pregnancy like hormonal changes, bio-mechanical factors, trauma, metabolic changes and genetic factors. The release of pregnancy hormones, structural and postural changes in pregnancy, gait changes, weight of the growing baby and changes in the center of gravity can all add to the development of PPGP. 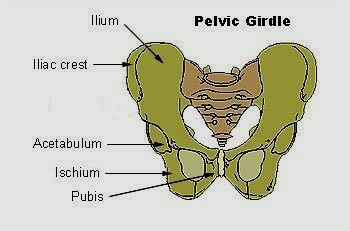 Having PPGP in a previous pregnancy predisposes the person to have pelvic girdle pain in subsequent pregnancy. Any change during pregnancy in the activity of the muscles in pelvic girdle, hips (hip abductor and hip extensor), lower back, abdomen, ankle (ankle plantar flexor) and pelvic floor can cause this condition. Remodeling of soft tissues, cartilage and ligaments over time or due to pregnancy by bio-mechanical and hormonal factors can also contribute to development of this discomfort. Many treatment options like exercises, exercises in water, physiotherapy, chiropractic manipulations, medication, educational interventions, acupuncture, use of mobility aids, and intensive multidisciplinary bio-psycho-social rehabilitation treatment are available. For very severe debilitating cases during pregnancy surgical treatment (fusion surgery) is considered. The available treatment options during pregnancy are limited by the presence and the potential hazards to the fetus. Self care and management can to a great extend contribute in the alleviation of the distressing condition. Take care to have sufficient rest. Avoid lying on your back. Lie on your side with a pillow between your knees to keep hip joints aligned. Be active within the pain limits. Take small steps while walking. Avoid any action or movement with knees apart. As far as possible Keep the knees together. For getting into bed, sit on the edge keeping the knees close together and lie down on your side by simultaneously lifting your feet. Do the reverse of it when getting out of bed. While shifting position in the bed keep the knees together. Avoid moving your knees apart. Avoid standing on one leg. Avoid carrying a baby on one hip during pregnancy. With the increase in clinical awareness of pregnancy related hip girdle pain syndrome and multidisciplinary medical approach there are significant improvements in the treatment and management of this multifactorial syndrome. Symptoms of pneumonia in the elderly. Blocked tear duct in newborn. 3. Nikolaos K Kanakaris, Craig S Roberts and Peter V Giannoudis. Pregnancy-related pelvic girdle pain: an update BMC Med. 2011; 9: 15. Published online 2011 February 15. Coping with pelvic girdle pain during pregnancy.